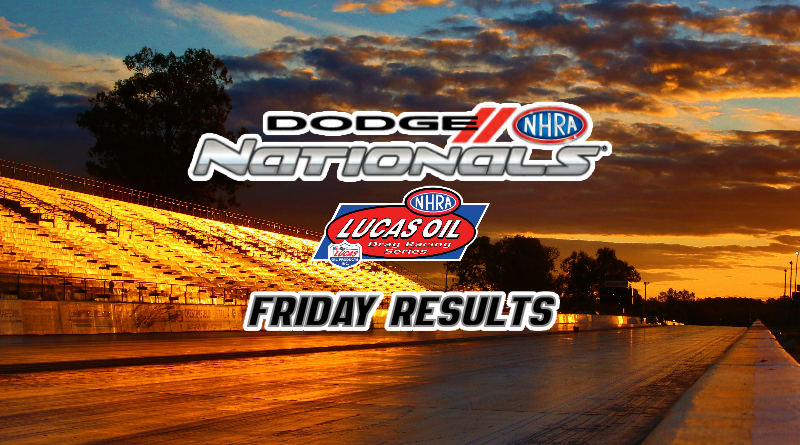 MOHNTON, Pa. – Final sportsman eliminations kicked off on Friday after a two-hour weather delay. The fields in Super Stock, Stock Eliminator, Super Comp, and Super Gas were cut in half after the first round of eliminations were completed. Although the weather has been a major topic this week at Maple Grove Raceway, NHRA officials were able to complete the entire schedule after a small delay due to a lingering mist on Friday morning. The sportsman classes took the afternoon off as the Pro’s took center stage. Business will pick up Saturday morning as all four sportsman classes will see plenty of action with three rounds of eliminations scheduled before noon. In my event preview article, click here to view, I selected three racers from each class as my picks to win the race. After round one, I’m looking pretty good as the majority of my picks made it through the first round. See below for more details on each class. The biggest name to fall in round one was NHRA superstar Dan Fletcher who was also on of my Super Stock picks. Fletcher turned it -.022 red against New England winner Anthony Bongiovanni. Bongiovanni laid down a solid .045 package on the free pass. Bongiovanni will take on James Antonette in the second round. Although Fletcher fell, I went 2 for 3 when Anthony Bertozzi and Pete D’Agnolo were both victorious in the first round. Key matchups in the second round include the aforementioned matchup between Bongoivanni and Antonette, Joe Lisa against David Barton, and what should be a fun race to watch with Bertozzi battling Michael Iacono. SAM Tech Factory Stock Showdown series champ David Barton fell to Allyson Smyth in round one when he fouled by -.009. Smyth’s .031 reaction was solid but she ran under by almost a tenth on the free pass. Another big name racer to fall in round one was Randi Lyn Shipp. After winning the New England Nationals earlier this year and making back-to-back final round appearances at Sonoma and Brainerd, Shipp was sent home early after Joe Santangelo dropped a .003 light on her. Shipp’s .061 left her way behind in the race as Santangelo paced her through the lights for the easy win. I’m 3 for 3 in Stock as Anthony Fetch took a double-breakout win by .001 in the first round over Kenny Richard. I’m feeling pretty good with Fetch, Smyth, and Santangelo still in contention. Key matchups tomorrow include Jim Boburka against Frank Argona and Allyson Smyth against Bubba Linke. Several big names fell in round one of Super Comp including Anthony Bertozzi, Tom Stalba, Alan Kenny, Dan Fletcher, and defending event champion Lauren Freer. Bertozzi lost to the .014 package of Bill Krug, Kenny missed the tree and broke out while his opponent, Kenneth Moses went 8.900, Fletcher lost a dumpfest with Labbous when he broke out by -.004, and Lauren Freer lost an 8.904 to 8.908 race against Christina DiBartolomeo after she missed the tree. As far as my picks go, I ended up 2 for 3. Devin Isenhower continued to shine with another nasty lap in his red-light victory over Michael Handras in round one, he was .011 at the tree and 8.898 at the stripe. Mike Robilotto also continued his recent hot hand posting an .018 package to box out Joey Cambria in round one. The sickest race of the round came when Tom Stalba gave up the stripe by -.001-second to Jack Sepanek after a perfect .000 reaction time. Sepanek was .027, 8.912 for a .039 package while Stalba posted a slowing 8.940 for a losing .040 package. Key matchups to watch in round two include Devin Isenhower against Jack Sepanek and Labbous against Chris Garretson. Garretson, who’s been hot all year in the Division 1 Lucas Oil Drag Racing Series events, posted an 8.889 pass at just 130 mph in his first round red-light win over Kathy Smulligan. It will be interesting to see how Labbous sets up for the MPH difference. More big name racers fell in Super Gas on Friday including Iggie Boicesco, Labbous, and defending event champion Kevin Robb. There were a number of really interesting races such as Charlie Kenopic’s .002-second victory over Stevie Ray Koncen. Kenopic left first, .010 to .032, then pedalled to a 9.927 to narrowly hold off the 9.907 of Koncen. Devin Isenhower defeated Michael Handras for the second time on Friday as they met in round one of Super Gas and Super Comp with both races going to Isenhower. The Super Gas race was a good one as both drivers left with .01 reactions but it was Isenhower dropping to a dead on 9.908 to take the win over Handras’s respectable 9.919 effort. Isenhower’s impressive run continues! Tom Stalba lost two races by a combined .003-second on Friday morning after giving up the stripe in Super Comp by -.001 and losing a tight 9.905 to 9.903 race against Lauren Freer in Super Gas. In the race with Freer, both drivers left with .024 bulbs and both dropped to go dead on the index with Freer taking the .002-second victory when her 9.903 was just enough to cover Stalba’s 9.905. What a tough day for Stalba. After a posting a perfect 9.900 in the New England LODRS final last weekend, Boicesco just missed a perfect light in his round one matchup with Justin Lopes as he was -.002 early ending his weekend. Little John Labbous fell in round one after taking an .008 to .014 lead over Ed Alessi Jr. off the line. Down track, Labbous took too much stripe posting a breakout 9.892 pass to Alessi’s dead on 9.908. There are several great matchups scheduled for round two such as Isenhower versus Steve Sisko, Mike Sawyer against Jason Kenny, and Charlie Kenopic versus Justin Lopes. That’s a wrap for Friday’s action, check back throughout the weekend as we’ll have more updates. DragChamp is your source for sportsman drag racing news online, be sure to check us out daily to keep up with all the NHRA sportsman class racing results.